Host & Attend a Supper Club! 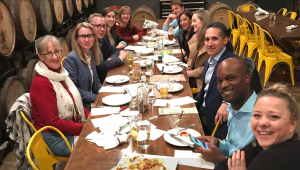 Supper Clubs are informal meet-ups for ELGL members to share a meal and talk about local government. ELGL members organize Supper Clubs - anyone can take the lead on organizing! ELGL will help you with online advertisement, member outreach, online registration, and event promotion. We'll also cover the cost of the first round or appetizers! Show up at the Supper Club and have fun! ELGL membership is growing everyday and there are other ELGL members in your area or close by. We will help you get connected to organize a great Supper Club. Here's an overview document about planning a successful Supper Club. We have ELGL members in regions all over the country and world!